Premature deaths or ongoing high maintenance costs associated with relatively new boilers are not as uncommon as you might think. The boiler above was brand new in 2008. In 8 short years it had failed to the point that it had become dangerous to operate. Sometimes well intentioned mechanical contractors and building operators make the decision to operate their standard efficiency (mid-efficiency) boilers at lower water temperatures, either to save energy or to reduce overheating problems affecting the comfort of building occupants. When boilers experience return water from their building systems at approx. 140 degF or lower a very acidic condensation begins to occur in the combustion gases. That condensation drips back down the boiler flue venting and over the boiler heat exchanger, slowly corroding the heat exchangers and other components with its relentlessly corrosive properties. 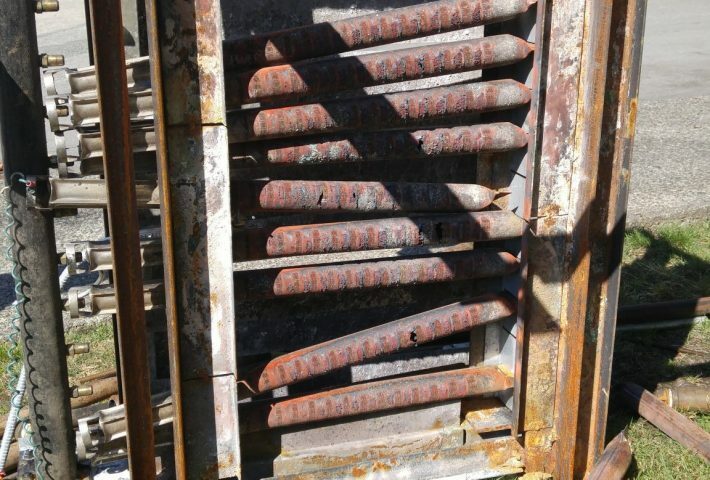 The result in the boiler above is a series of gaping holes in the heat exchanger that allow flames and the products of combustion to enter the mechanical room and the building itself. If you see flames licking up from underneath your boiler, shut it down immediately and call in your mechanical contractor. Replace your boiler with a high efficiency model that comes standard with materials and safe guards that are designed not only to withstand acidic condensation but also to take advantage of the low water temperatures to increase boiler efficiency up to 96% as compared to 80% – 85% with standard boilers. These high efficiency models also have significant onboard control advantages that have resulted in a minimum 20% reduction in natural gas bills on the projects that HiH Energy has been involved in. They also qualify for incentives, making the business case very attractive.